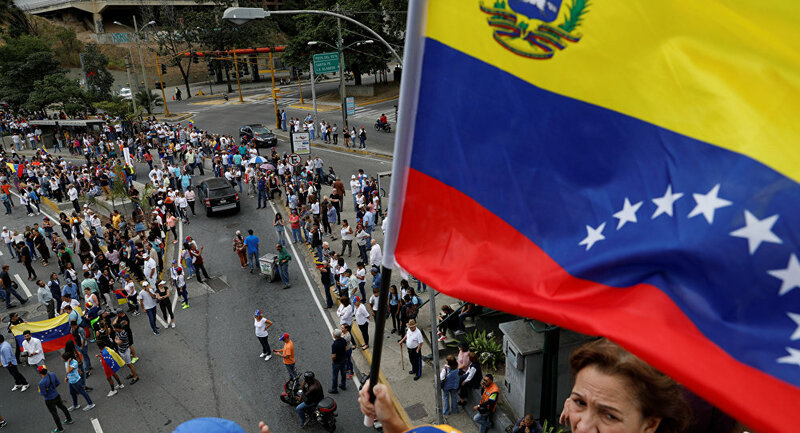 Pro-government rallies are taking place in several districts of Caracas on Saturday, with the majority of demonstrators gathering in Plaza Bolivar. Thousands of people have taken to the streets in several states of Venezuela to support opposition leader Juan Guaido, local media reported on Saturday. Venezuela is currently facing large-scale anti-government protests with opposition leader Guaido having declared himself the country's interim president on 23 January. Maduro has repeatedly blamed Washington for being behind a state coup in Venezuela. Mexico, Uruguay, and Russia were among the countries that have voiced their support for Maduro as the only legitimate leader. Photos in social networks and video published by the TVVenezuela broadcaster and the Nacional portal show crowds on the streets and squares of the Venezuelan states of Zulia, Lara and Carabobo marching with banners and chanting slogans in support of Guaido. "There is a need to mobilize today, go to Bolivar Avenue [place of the march of Maduro's supporters]. Defend your homeland. Defend our independence," Venezuelan Foreign Minister Jorge Arreaza wrote on Twitter.